The Office of the Chief of Police proudly presents the Buena Park Police Department 2016 Annual Report. The annual report provides a snap shot of the Buena Park Police Department and our Commitment to Service. 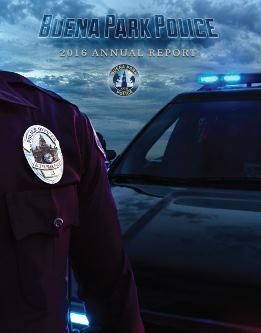 While the annual report is merely a sampling of our Department, it encompasses a wide range of information including, our organizational operation, crime statistics, staffing, community involvement, events and programs. Please click the icon below to view the publication.